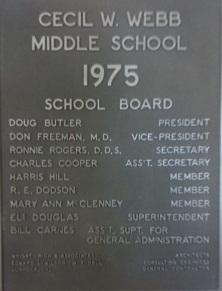 I was the first band director at Webb Middle School in Garland, Texas back in the mid-seventies. I wrote an original school song the first year I was there. I recently saw the current band director at the TMEA Music Convention and he asked me to see if I could redo it as all parts and the score had disappeared over the years. I came home yesterday and got right on it. Here are the words. WEBB BEARS, we will honor, our days with you. Spirit and pride bring glory to our school. Your memories we'll cherish as the years unfold.